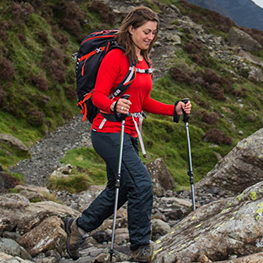 We can customise the fit of our walking boots and shoes to provide you with an unparalleled level of comfort. Just imagine how happy your feet will be in footwear personalised to fit, no more squashed toes or painful bunions! You don't even need to wait- the customisation process is completed in store and only takes approximately ten minutes. Whilst we are hard at work, you can literally put your feet up and relax with a complimentary cup of tea or coffee! And we haven't even mentioned the best bit - it's free! We offer free customisation on all footwear purchased from us! 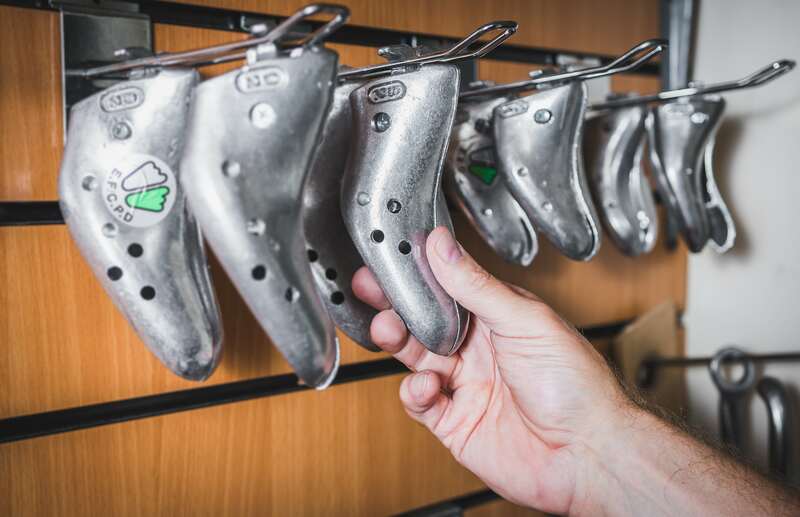 Once our specially trained fitters have helped you to select footwear that is the right size, width, volume & shape for your feet as part our award-winning Specialist Boot Fitting service, then we can begin the customisation. We use our expertise, in combination with your feedback, to assess where and how the fit can be improved. It is important to note that we never customise ill-fitting footwear as a shortcut to a slightly better fit. We only customise footwear that is already feeling good but just needs a little extra adjustment and personalisation for optimum comfort. Using our specialist machinery and years of experience, the footwear is gently steamed and stretched. This process is done in small increments to allow us to fine tune the fit. We personalise the fit of the footwear to match the unique features and contours of your feet in a way that no footwear could match straight out of the box. After the initial customisation we recommend the customer tries on the footwear to ensure they are happy with the fit. The fitter will also assess if the adjustments have achieved the desired result. Further steaming and stretching, again in small increments, will be carried out where necessary to achieve the optimum fit. For more substantial customisation it may be necessary to adjust the fit of the boots using the specialist Italian stretching machine. Boots are left on the machine overnight for the best results. This is a highly skilled process which is undertaken by our senior fitters. 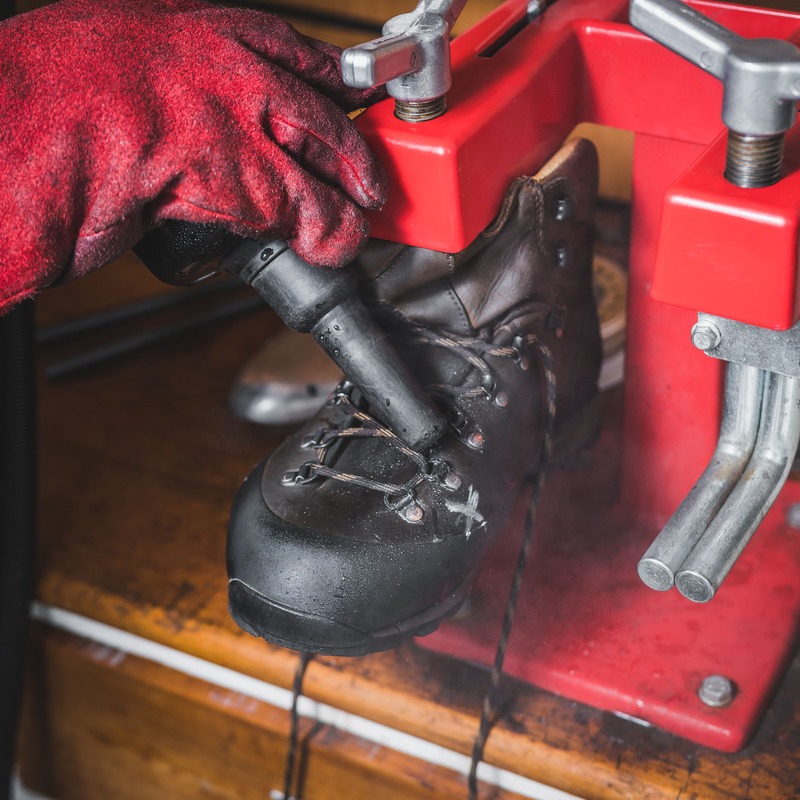 Customising the footwear through steaming and stretching, mimicks the natural changes that occur in footwear as part of the infamous 'breaking-in' phase. Normally heat from the feet, combined with the pressures exerted by the feet, mould the footwear (where physically possible) around the feet. This 'breaking-in' phase can be lengthy and not only cause agony for the wearer but long-term damage to the feet. Walkers put up with this pain in the hope the footwear will soon be comfortable, unfortunately however this isn't always the case. If the footwear is a bad fit, you can endure pain without a significant improvement in comfort. By applying heat via the use of steam and gently exerting pressure on the footwear via stretching, we are accelerating the 'breaking-in' phase without causing you any pain or discomfort. Plus, you know the footwear is the right fit so the outcome will always be a custom fit, exceptionally comfortable pair of walking footwear. Our customers are always surprised at what a difference stretching can make to the feel of the boot or shoe - they are happy with the fit before customisation, only to have a revelation upon trying on their newly customised footwear! Customisation takes a boot from feeling good, to really great! Relieves small pressure points and creates extra space for the specific points of the foot that need it such as little toes, bunions, hammer toes and heel spurs. In the case of bunions, we carefully create a little “pocket” for the bunion to sit in comfortably, free from pressure and discomfort. Helps to ensure both left and right feet are comfortable. It is very common to have differences between the left and right feet, steaming and stretching allows us to tailor the footwear to fit each foot individually. You don't need to go through an agonising 'breaking in' phase with the footwear. Choosing footwear that is the right size, width, volume and shape and having it customised to fit helps you to have have happy feet, in comfortable footwear, from day one. You get a personalised boot which offers amazing comfort without the cost (or waiting list) of a fully custom boot. 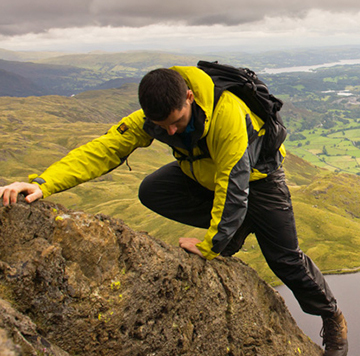 Discover more "Why you don't need custom made boots: you need customised walking boots". How much does the customisation service cost? It's absolutely free! We do not charge for customising footwear purchased from us. Do you customise footwear purchased elsewhere? Yes, we can steam and stretch footwear bought elsewhere. Takes approx 10 minutes and can be done in store whilst you wait. Needs to be left overnight for optimum results. 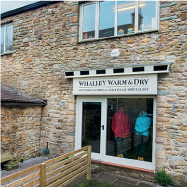 We do not charge for customising footwear purchased at Whalley Warm & Dry. Do you offer a made-to-measure service? No but we believe our award-winning specialist fitting service, footwear available in five different widths and half sizes (which gives us over 170 different fitting options) plus our free customisation service can help you to get the fit and comfort of a made-to-measure boot or shoe at a fraction of the cost and time. Find out "Why you don't need custom made boots: you need customised walking boots". Does it damage the upper? We have been customising footwear in this way for over 12 years and we have seen no detrimental effects to the upper (or the footwear as a whole) as a result of customisation. Steaming and stretching the footwear mimicks the natural changes that occur in footwear as part of the infamous 'breaking-in' phase. Normally heat from the feet, combined with the pressures exerted by the feet, mould the footwear, where physically possible, around the foot. By applying heat via the use of steam and gently exerting pressure on the footwear via stretching, we are accelerating the 'breaking-in' phase without causing damage to the upper. However, not all footwear is suitable for customisation. Boots and shoes comprised of inferior materials would not be appropriate for this accelerated process of change. 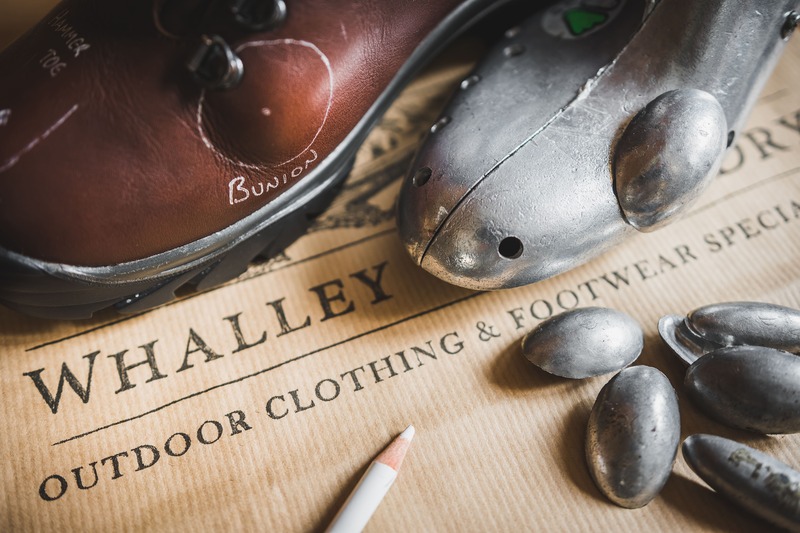 We carefully source footwear from across Europe and only stock brands which use high quality materials with strong, supple uppers which are entirely suitable for customisation. Yes, the adjustments are permanent. In most circumstances, customisation of the footwear can be completed within ten minutes. 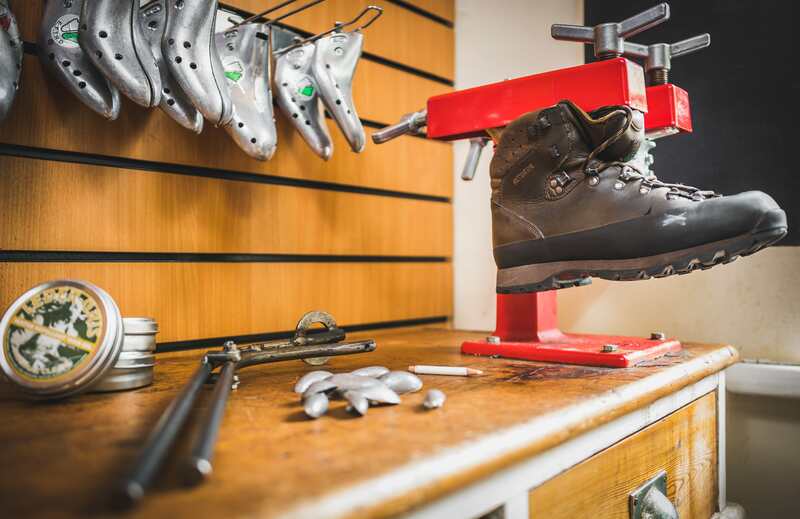 If our senior fitters believe more substantial customisation is required, the footwear may need to be left on specialist machinery overnight. Does it affect the guarantee of the footwear? No, it does not affect the guarantee of the footwear. Do I need to try on the footwear after it has been customised? We recommend trying on the footwear after it has been customised to ensure you are happy with the adjustments that have been made. Our fitters will also assess if the customisation has achieved the desired result. Further steaming and stretching, in small increments, will be carried out where necessary to achieve the optimum fit. Can you alter the length of footwear? No, it is not possible to alter the length of the footwear. If the footwear needs stretching does this mean it's not a good fit? 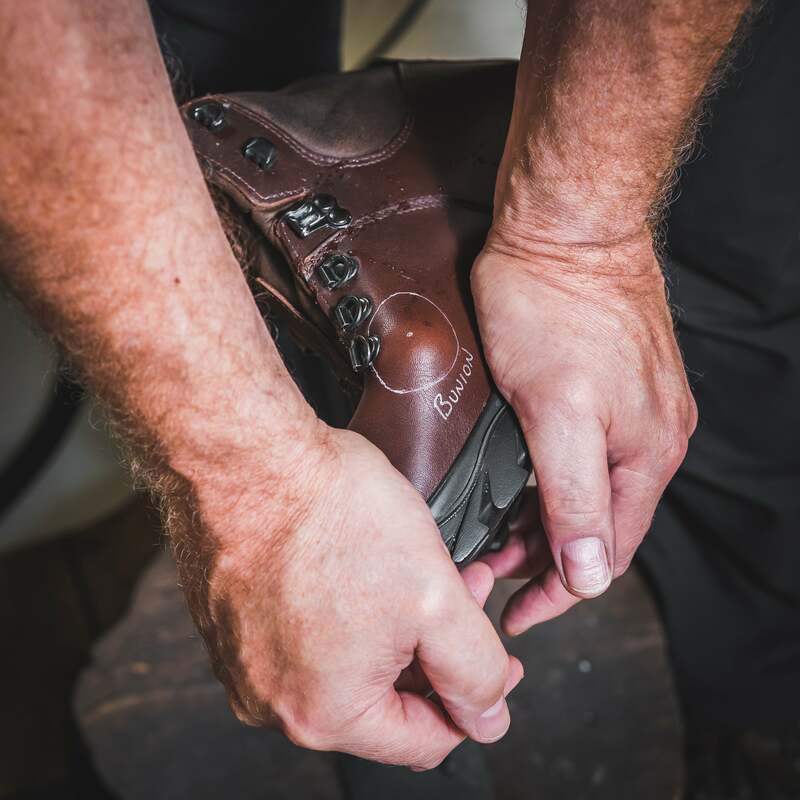 We only customise footwear that our Specialist Boot Fitting Service has revealed is the right size, width, volume and shape for your feet. By steaming and stretching, we personalise the fit of the footwear to match the unique features and contours of your feet in a way that no footwear could match straight out of the box. Steaming and stretching takes a pair of boots or shoes that are already feeling good and makes them feel great. We do not customise ill-fitting footwear as a shortcut to a better fit. Yes, we strongly recommend making an appointment. 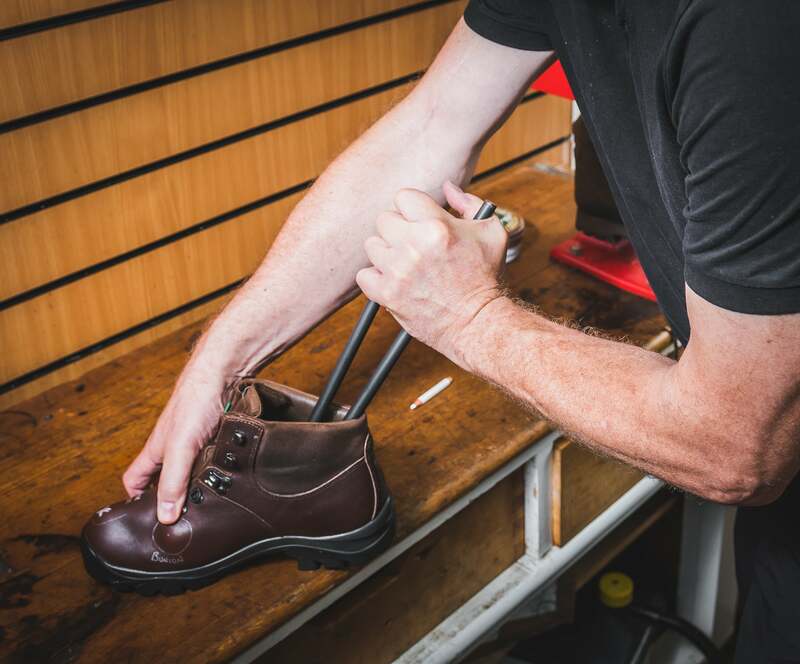 Our customisation service is part of our award-winning Specialist Boot Fitting Service which attracts thousands of people from across the country to visit us and as such we get very busy in store. To avoid unnecessary waiting on arrival, we urge people to make an appointment prior to visiting us for footwear. You can make an appointment online here or call 01254 822 220 and one of our fitters will be more than happy to discuss your needs and book an appointment for you. You don't need to compromise on the fit of your footwear. You don't need to settle for footwear that fits "ok" and doesn't cause "too many problems". You don't need to worry about your feet whilst out walking. You can discover the delight of walking in comfortable footwear that feels like it was made for you. You can have happy feet and be a happy walker! All you have to do is book your appointment. Book online or call us on 01254 822 220 and one of our fitters will be more than happy to discuss your needs and book an appointment for you.